Cables are the old way. Everyone knows cables have a tendency to fray over time. 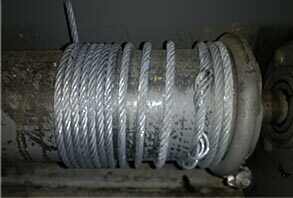 Frayed cables can break and doors can come crashing down on aircraft, machinery or even people. Cables require more servicing, are hard to work with and difficult to replace. Replacing cables with more cables is a timely and costly expense and can be a real safety issue if the cables are not kept in good condition. Schweiss has figured out and designed a way to modify any bifold that's ever been manufactured. Retrofitting an existing cable door over to the Schweiss design "Lift Straps" on other brand bifold doors, no matter the make or model. Schweiss has brought relief to customers with the old vintage cable bifold doors. Finally, the customers with cables can be at ease. They're able to do away with the antiquated cable lift design and retrofit any style or brand bifold door over to the latest and greatest Schweiss "Lift Straps." The strap advantage is huge. Straps are longer lasting, never rust, never tangle, are flexible, open a door faster and are 100 percent quieter than steel-on-steel cables. With lift straps, door owners get a "soft start" and "soft stop", adding to the life of the bifold door. Schweiss stands behind the "New Lift Straps" by carrying a 10-year warranty and straps outlast cables well over three times. "It's not your bifold door. Can I buy just the 'Lift Straps' and convert my door over to the straps?" "Can you convert my cable door over to straps?" "My door frame is good but I'm tired of changing out cables every couple of months!" "Will your straps work on my door, its another Brand?" 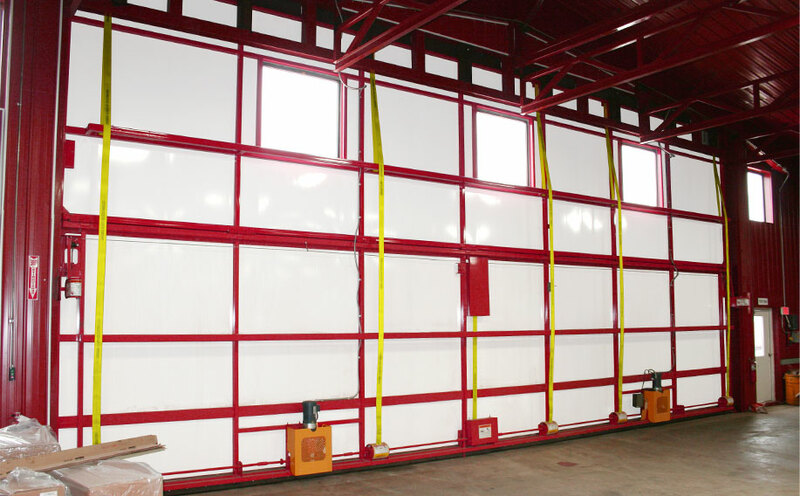 "I was at the neighbor's hangar and saw how smooth and fast a Schweiss Door operates. Can you help me?" "My door is not that old but I hate my outdated cables. Can you convert my door to straps and autolatches?" "I see your strap doors are much faster than my outdated cable door. What's it gonna cost me?" "I was trying to save money by going with cables. Boy, what a mistake!" "Why would anyone even consider outdated, slow cable doors today. I wish straps were available when I purchased mine!" "Nobody will sell me another cable door!" "The Strap conversion made my door better than new!" "What a nice Improvement to an older door!" "Straps and auto latches, what a great improvement!" "You guys are good, thanks for the neat invention!" "Should have done the strap conversion years ago!" "If anyone asks. send'em my way and I'll be your salesman. I love my door now!" 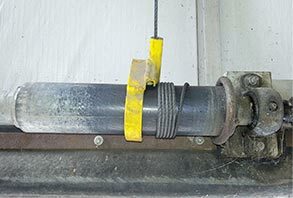 Schweiss has recieved thousands of calls from owners of existing out dated cable bifold doors wanting to retrofit their outdated cable lift system with the Schweiss "Lift-Straps system." Schweiss's excellent success with the New Lift Straps has revolutionized the door industry. It's a no-brainer. Why bother with cables? It becomes obvious when you understand why the new patented Lift Straps are the smarter way to raise and lower your bifold door. Smoother, safer, faster and quieter. Like a customer once said, "My strap bifold door is the envy of my fly-in community. I'm happy I bought the Schweiss Door!" For years, bifold doors have been lifted and lowered by the conventional means of steel cables. Schweiss Doors have been using the popular, long-lasting lift straps for over 20 years. Now 99 percent of our customers are demanding polyester lift straps for this function. Why? Because lift straps offer more lifting ability, won't fray or overwrap! The strength-to-weight ratio on straps is extremely high. The 3-inch straps are rated at 29,000 lbs, where 1/4" cables are rated at only 7,200 lbs. In addition, the safety factor on straps has well over the standard 5:1 ratio. back to cables . . . I don't think so! 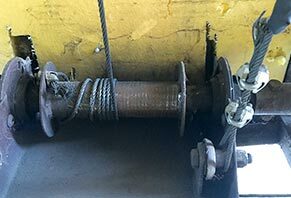 Below are testimonials / comments from customers who had outdated, older style cable lift doors that have been converted to the "New Liftstraps". . . And happy customers who have purchased the number one selling lift strap doors. "The straps run the door up faster and safer and I like the 10-year guarantee." "We also like the convenience of the liftstraps being faster than the old cables on our door." "We were having some trouble with frayed cables. I'd recommend liftstraps to anyone." "I was replacing cables that were always fraying and hoping for more door speed, which the straps give me." "The decision to get liftstraps on my bifold door was more of a safety issue for me." "We're having zero problems now with the liftstraps." "I'm very happy with the liftstraps and I wouldn't be without the auto latches." "So far so good on the strap conversion, I'm very happy with it." "The straps are faster and just keep feeding up with no problem. I'd recommend them." "The straps are 1000 times better than cables. My cables were breaking and keeping them adjusted was a big hassle - it was not a safe deal. I'm very pleased with the liftstraps and would recommend them to anyone." "We converted to liftstraps for reliability and aesthetics." "The straps were pretty easy to install. They are quieter, quicker and safer, and the safety shield system is really nice. I'm real happy with it." "The straps are rated for so much more strength, and now my door opens faster! We wouldn't order a door without "Lift Straps on them, they are working great." "I'm thrilled with liftstraps, they're great, and they open my door 10 times faster than before. I absolutely will recommend them to everyone." "I really like the liftstraps and autolatches. They definitely lift the door faster and that's one reason why I got them." "Straps are nicer than cables. We had issues with older cables. My door goes up a lot faster." "The cables wouldn't spool the way our door was set up 50 years ago. 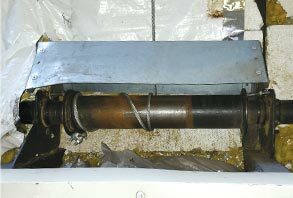 It also had an unlevel lift and caused problems. The straps are a really good solution." 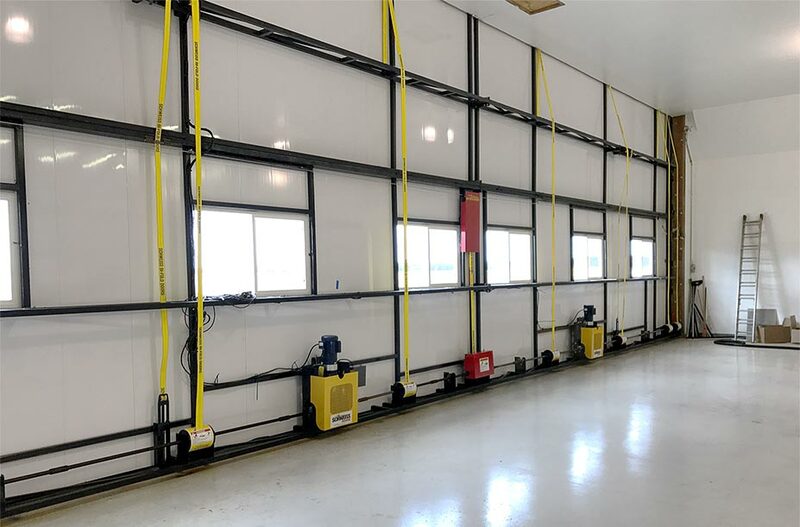 "Cables were breaking on our big hangar door and we knew the lift straps were a better system." "I can't say enough about your liftstraps, I wish I'd done it originally." "Our door with liftstraps now works really well - 100 times better than before. Our cables broke on us and that was a mess." "A lot of guys are coming to look at our door. I'm sure you'll be selling more Lift Straps, we like 'em!" "We were having troubles with the cables and replacing them once a year. Cables were difficult to adjust to make them lift equally on each side. The straps are lifting our doors smoother and faster now." "Straps are the only way to fly - no noise, no creeps, no crunches. Cables wear out." Cables are hard to adjust! Cables require cable clamps... no good! With cables, you have to deal with the cable clamps - proper tension on the cables is critical! 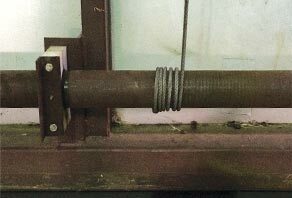 Cable doors require more maintenace, have a shorter working life, are slower, wear out sooner and aren’t as safe as straps. Schweiss Lifts straps have proved to be by a far superior method of lifting any bifold door. 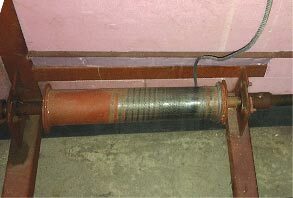 Lift straps wrap on top of themselves by design. No worry with overlapping issues or with cables rubbing against each other. Furthermore, everyone knows that cables are not even close to being as quiet as liftstraps. Can you imagine the noise that 2 or even 4 cables must make?